Theta Healing® works on all levels of your being: emotional, physical, mental and spiritual, by clearing the blocks and obstacles that are preventing you from achieving your fullest potential in your life. 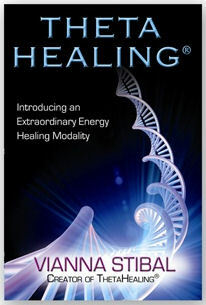 Theta Healing® is an extremely profound healing treatment yet very gentle. The healing actually comes from the infinite source of divine energy, the Creator, not from angels and guides. We all have our ‘beliefs’ that we have unconsciously acquired - from our ancestors, during our present and even past lives - and these reflect who we are, how we behave today and what we believe and therefore think. What we sometimes fail to see is that our limiting beliefs (like programs) are also the messages we are sending out to the universe - which in turn mirrors back and validates them. Sometimes we don’t like what the universe reflects back, and we may be completley unaware of what is truly going on inside us at that deeper level. A certified Theta Healing® practitioner is able to intuitively work with you to assist you in resolving this. In a Theta Healing® session, you will be able to discuss the issues you would like to resolve. The practitioner accesses the Energy of all that is, using theta brainwaves, in order to guide you through the session to change the energy vibration of the identified limiting beliefs to then replace them with ones that are more empowering for you. The practitioner follows the same process using the highest divine energy to instill your cells with the new patterning and what it now feels like to have this new belief, including: that you can accept it – that you deserve it – that it’s possible and you are allowed to have it – that you can have it without the fear of upsetting others…, and whatever else is most appropriate for 'you'. All the client has to do is sit quietly while the energy changes take place. Some people may have subconsciously acquired programs of self-sabotage or have an inability to trust and so may have experienced that healing never works for them. Some may even have ancestral programs such as 'healing is wrong or evil', or that they ‘have to’ suffer. This can all be changed and your cells brought up to date and released from this. It is usually best to have a few sessions and this can be done as frequently as you choose or feel comfortable with. This can be discussed with your practitioner after your first session. These are but a few of the ‘downloads’ you could receive during your Theta Healing® session, once the energy ‘blocks’ have been fully cleared to you being able to retain the new energies. A crystal layout session using Theta Healing is also possible for past life therapy. spiritual growth, self-esteem, self-confidence, finances, career, health and well-being, emotional issues, trauma, weight issues, creativity, relationships, self-sabotage, home, family, physical challenges, pain, phobias and fears, feeling lost, grief, business building and much more. Will I have to tell the Practitioner about my traumatic experiences? Theta Healing® is the fastest mind-body- healing modality I know of and in a session it is possible to clear several limiting core beliefs and programs. Most clients choose a one and a half hour session or a two-hour session to start off with. You may choose to continue your healing sessions at weekly, fortnightly, monthly intervals or whatever suits you best and feels right. In Theta Healing® so many more positive and lasting changes can be accomplished in a few sessions than is usually the case with healing. You decide which areas of your life you wish to work on - and how much you really want to invest in getting your life back on track. Not really. Unlike EFT tapping, Counselling or Psychotherapy it is unnecessary to talk all the experiences through. With the guidance of a Theta Healing® practitioner, you can uncover the wisdom you have gained through any of your life experiences, then remove the outworn programs and replace them with new feelings and more self-empowering programs. Sometimes the trauma you feel may come from your ancestors or indeed past lives, which I will be able to detect from the reading. You will be sitting in a chair with the Practitioner and explain which aspects of your life, health or behaviour you wish to change. The practitioner will usually hold your hand, make sure you are comfortable and that you feel safe, and give you water to drink. You just need to be ready and willing to participate in your own healing. Once we have uncovered what energy programs need to be healed, the energy shifts actually happen instantly and people often experience this as a gentle tingling or feeling of relief. Often other images or memories will arise during the session. That just means your unconscious is working with you, showing you it is the right time to resolve and let go of that old issue. Although there may be many suppressed emotions and memories which may arise during your session,you will be expected to hold a courteous and co-operative manner throughout sessions in order to maximise the efficacy of the time spent. Yes, decide what you’d like to work on and drink plenty of water. Allow yourself some ‘quiet’ time too for after the session. If you have been highly stressed then this may have caused a high level of acidity in your body and your Ph balance may be off. Sipping water with a little lemon juice is a great help for this and avoid tea, coffee and sugary food and drinks.